After the initial excitement, enthusiasm about e-Government has greatly diminished over time as the term has come to be equated with simple administrative services such as driver’s license renewal and online income tax filing and no real transformation seemed to be taking place from e-Government as anticipated. The future of e-Government also seemed bleak and, to many, e-Government has reached its ultimate destination of mediocrity and the past trend seemed to suggest that e-Government is not going to get any better than what we have now. 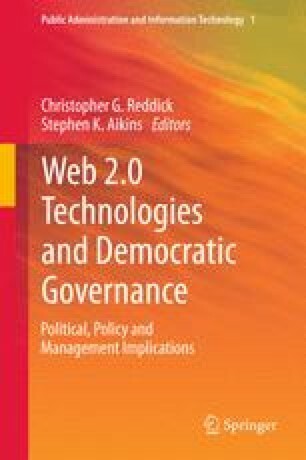 In such context, this chapter explores the implication of the rise of Web 2.0 in the future of e-Government in America. The emergence of Web 2.0 and increasingly available public data and information has created a synergy in which nongovernmental actors such as citizens and NGOs became increasingly capable of developing e-Government type services that have typically been developed by the government. This shift from a single-developer (monopolistic) model of e-Government to a multiple-provider model can work as a foundation from which the real transformative potentials of e-Government may materialize as the new model introduces a much wider spectrum of resources, innovativeness, and political incentives than the traditional model. The implications of the emerging trend in the future of e-Government as well as the changing role of government in e-Government are discussed.